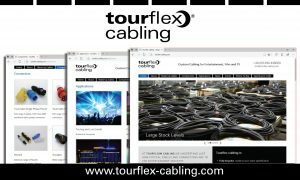 Tourflex® Cabling, the cable manufacturing division of A.C. Entertainment Technologies Ltd. (AC-ET), has just launched its new dedicated website – www.tourflex-cabling.com. Phill Capstick, AC-ET’s Managing Director said: “Custom cable assemblies for Entertainment, Film and TV is an important part of the business, but it’s always been difficult to explain the full range of what we’re able to do as there are thousands of options. Having a dedicated site for Tourflex Cabling helps us to do this. Phill continues: “We’ve recently invested heavily in testing equipment so that each and every cable assembly manufactured in-house conforms to the high build quality that our customers require, and we think this puts us in a leading position within the market because we know how important this is to them. Tourflex Cabling will be represented on the A.C. Entertainment Technologies stand at the upcoming PLASA (stand E30) and IBC (stand E71 in hall 12) tradeshows. For information on the full range of product options available, visit www.tourflex-cabling.com. Or to place your order, please call +44 (0)1494 446000 or email info@tourflex-cabling.com.